The idea that an African American could become a member of the Ku Klux Klan is silly enough that it became a joke on Dave Chapelle’s television show. Of course, this movie isn’t a comedy sketch, as it is based on true events. Obviously, there were plenty of elements in this film that were likely fictionalized to make the story more “Hollywood,” but it’s still an interesting story, nonetheless. Part of the trick of this movie, though, is that it treats itself almost like a half-modern documentary of the KKK as well, which makes it seem like there wasn’t enough source material to make an engaging plot. Another part of me was interested in this movie for its setting. Living in Colorado Springs, it was interesting to me that certain landmarks and places in town were referenced, which merely added realism to the story as it was presented. From NORAD and Fort Carson to an off-handed reference to Nevada Avenue, I could relate with the Colorado Springs of the 1970s, even though much has changed in the nearly 50 years since then. Of course, if the video clips from 2017 reveal anything, it’s that little has changed when it comes to the KKK. As a white Christian male, this film upset me. Not that it painted white men in a negative light, but rather that it helped expose the bigotry and hatred that has festered in this country from the very beginning. I hate how the KKK uses the church to spread its elitism and message of dominance, instead of the Bible’s message of love and acceptance. The evil that has so twisted these people that still exists today needs to be acknowledged by films like this, but I also think it might work even better as a straight documentary, instead of a slightly fictionalized version of real events. 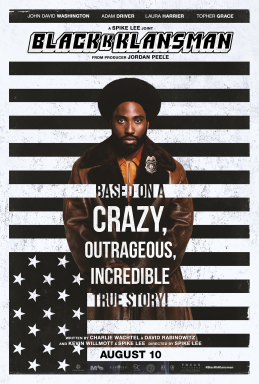 An amusing, but equally convicting film, I give BlacKkKlansman 4.0 stars out of 5.